In our e-commerce world, few tools are more indispensable and effective for retaining wine club members and generating more wine sales, then personalized outbound telesales campaigns. Your DTC team can focus on in-person tasting room interaction. Our data-centric approach to outbound telesales will maximize ROI on customer acquisition cost, drive sales, retain wine club members, and grow your bottom line. 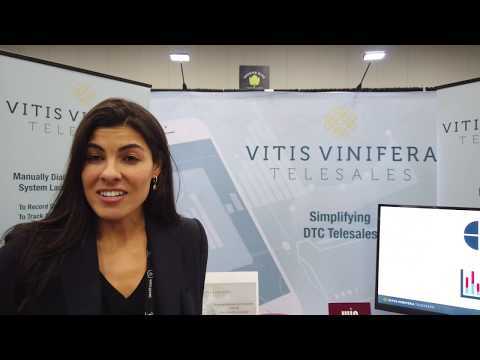 Capitalize on the unstoppable growth of the DTC channel, by outsourcing the management of your calling campaign to Vitis Vinifera Telesales. Allow your DTC team to personally interact with your tasting room customers, and let us manage the outbound telesales campaigns. As a committed ambassador of your winery, we will deliver sales revenue based on consumer trends, wine industry trends, and a passion for your brand. 1. Organize and Prepare in Advance - A properly segmented campaign results in 83% success rate. Know your customer. 2. Know the Purpose of your Call - What is the goal of your outbound calling campaign? Market Growth? Product-Growth? 3. Ask the Right Questions - Prepare 5-6 questions that Pull your customer through the sales call. 4. Prepare a Script, but Never Read from It - Always sound confident, and let the conversation flow naturally. 5. Generate Interest in the First 10 seconds - Your RTC ( reason to call) should be memorable. Use terms such as, "allocation" "last of vintage" "limited release" "member exclusive." 6. Practice Makes you Perfect - It's intimating to pick-up the phone to sell to your customers, but after repeat success, you will become a confident professional. Customers crave relationships, and with every telephone call, comes a chance for brands to build a connection and deliver engagement. Direct communication between companies and their customers is a vital element of sales and marketing. If a winery is not investing an outbound calling campaign to its existing customers, it’s ignoring a part of the customer experience lifecycle, that 83 % of U.S. consumers claim reflects how much a brand values their business, over any other touchpoints, such as email marketing or digital post, this is according to a recent study by Accenture. Telesales is intimidating and requires skilled expertise, we train our sales agents to use the“Pull” Communication Strategy. When our sales agents ask questions, we are engaging with wine club members, therefore allowing the customer to drive the communication (that’s what we want them to think) and in turn reveal their needs and wants, and we “hypothetically” sell less and in turn the customer always purchases more. Ditch the script, and listen to your customers, make sure to ask at least 5-6 probing and leading questions to drive the “pull” conversation, and you will be amazed at how much more wine you can sell when you give your customer the power to pull you along and deliver a memorable customer experience. Your customer will walk away from the call with an overwhelmingly positive feeling, they will feel “special” and “valued.” More importantly, your wine brand will be top of mind, and your customer will definitely share that VIP experience with friends and family, it’s a powerful connection. 48.0% of tourist who visited Willamette Wine Country selected which winery to visit based on word-of-mouth, while only 22.6% selected based on the winery website. This is according to a survey released at the Oregon Wine Symposium. When a winery connects with their wine club member over the phone, it leaves a lasting impression, a powerful impression, because this brand is delivering value unlike any other wine brand. These customers will drink more of that brand, talk about that brand, and therefore build the long-term relationship. Additional data in the survey revealed that 24.4% of tourist to the Willamette Valley made their decision on which winery to visit based on the opinions of friends and relatives over marketing from wine events, wine club emails, wine-related magazine, or a wine shop. This further demonstrates the power of the personal touchpoint of connecting with customers over the phone, and giving them something to talk about. With customer acquisition cost hovering at 30%, why spend more money chasing new customers, when your existing customers are just waiting for their favorite winery to ENGAGE with them. What type of customer experience will the family winery deliver after the customer leaves the tasting room, beyond the e-mail campaign. The metrics of email campaigns tell a wonderful story. A segmented email campaign, to a targeted 303 recipients, will have an average of 291 successful deliveries, that’s a 96% success rate, but only 31.7 % open rate, and even lower 3.1 % click rate. The pyramid of influence, shows us that a company can nurture a customer’s brand loyalty, through increased exposure to their brand. Connecting with your wine club member, with the personal touchpoint of a phone call will create a domino effect beyond your wildest dreams. The wine club member who receives a call, will mention it to impress his buddies on the golf course, she will brag about her VIP status with the winery at the next girl’s night out, and they will drink a bottle of that wineries wine from their cellar, creating a need to replenish inventory in the near future. This is just one example, of the long-term value of engaging your existing wine club members with the personal and powerful touchpoint of a phone call. But, managing an outbound calling campaign requires a tremendous investment of time, resources, trained telephone sales agents, and the technology required to run a profitable calling campaign. Limited production wineries <1,000 cases, very small wineries 1,000 – 4,999 cases, and small wineries 5,000 – 49,999 cases, represent 96% of the $3 Billion value of DTC shipments in 2018, according to the Sovos, Wine & Vines Analytic Report, released last month at the annual DTC Symposium, in Concord, CA. These wineries rely on a very limited in-house staff to manage many of the capacities required to maintain a healthy DTC sales channel mix. They may ask a part-time, retired, tasting room associate to “try” to make telephone sales to their top 20% of wine club members, and realize this approach cost them more money, than generated profits. Telephone sales requires specialized training and experience, it’s not easy to sell over the phone, even to your existing wine club members. Although it may seem, as a cost-savings, approach, to have an untrained employee “try” their luck at phone sales, in the long-run, management will realize it’s a much more complex capacity, that requires trained expertise. In addition to trained staff, software technology required to run a successful campaign is costly, and again, requires another trained IT expert to manage the day-to-day. The value of calling wine club members can yield profits of up to 30%- 40% of sales revenue. It’s an untapped sales resource, that is complex and requires trained expertise. Consider outsourcing your next outbound calling campaign, stand out from the competition, and deliver a memorable customer experience. Every wine club member wants to feel special. New members do not understand the benefits of the club, and current members want to feel appreciated for their loyalty. Once your customer leaves the tasting room, how do you maintain exposure to your brand? Calling your customer, is a powerful, and personal touchpoint. Only 31% of your wine club member’s live driving distance, more than twice as many are at risk of attrition from lack of exposure to your brand. You can engage with customers across the country with an outbound calling campaign. 40% of subscribers require apersonalized experience. There is nothing more personal and powerful than calling your wine club members. With an increased decline in tasting room visitation, it’s imperative to nurture your existing wine club members. Customer Acquisition Cost are 30% and the cost of maintaining customers is 5%. In 2018 there were 9,645 wineries, today the number is 10,016. With 371 new wineries competing for the same market, your winery can deliver value with an outbound calling campaign, and standing out from the competition. Small wineries dominate the DTC channel, producing 43% of the total cases shipped and account for 46% of the total value. Households have tremendous options when it comes to allocating discretionary income to annual wine spending. People love to talk about wine, calling your wine club member build loyalty. The value of a wine club member is extraordinarily high, wineries cannot over communicate with a customer. Your customers will absolutely welcome a call from their favorite winery. Consider Outsourcing the calling campaign to Vitis Vinifera Telesales. Our expert sales agents are trained to overcome objections, increase AOV, ask for the sale, and most importantly, engage with your most valuable asset, your wine club members. I've been selling wine for eighteen years. In order to be successful as a sales person, I had to know my customer. It's absolutely fundamental to recognize, not only consumer trends, and market trends, but know exactly how and when to strike with the data collected. Analyzing the purchase patterns of my top 20% of customers, over time, provided me with priceless data. If I analyzed this data in different combinations, I could easily target other customers with similar behavior, and grow my business by targeting the right customers, with the right product, at the right time. This approach saved time for me, my customers, and more importantly, gave me the credibility as a sales person who brought value to every sales call. Essentially, I was selling less, metaphorically, and my customers were buying more. The upside to selling wine over the phone, is that everyone loves to talk about wine. Some timing patterns help the success rate along a little bit, combined with a great product, and a knowledgable sales professional. Can You Afford Not to Call? Manually dialing on an office phone, lacks the critical functionality of tracking sales performance metrics, which decreases the powerful and profitable touchpoint of your outbound calling campaign. Outsource Your Calling To Us! With our virtual contact center, our telesales agents are measured by average handle time, conversion rates, first call close, and AOV. We collaborate with your DTC team to build winning brand centric campaigns, and segmented list to reach the right customer at the right time, with the right message. Capitalize on the unstoppable growth of the DTC channel, outsource the management of your calling campaign to Vitis Vinifera Telesales.